Last night, I watched the first two episodes of No Podrás Dormir Esta Noche, a new horror-themed web series. And I absolutely loved them! Now, before I start this review, I should explain that yes, this is a Spanish-language series but, in case you don’t speak Spanish, you can turn on the English subtitles while you’re watching it. And really, horror is pretty much the international language. As for the series itself, it’s a lot of fun. 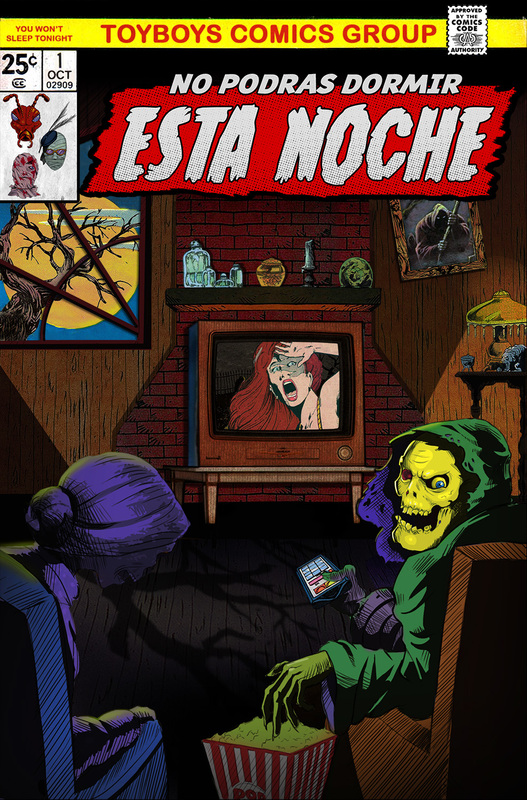 No Podrás Dormir Esta Noche is a loving homage to all of the old horror anthology series. The opening credits, which contain recreations of scenes from our favorite B-horror movies (a scientist turns into a monster, an invisible woman removes her bandages, two campers discover they’re not alone in the woods, and a kid discovers something under his bed), perfectly set the mood. 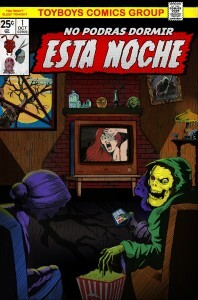 No Podrás Dormir Esta Noche is a show for those of us who love a good and fun tale of terror. The first episode, Golpee Antes de Entrar, plays a fun game of bait-and-switch with the audience. A nurse named Lucy is seen praying at her father’s grave. As she walks away from the grave, the ground starts to move. Suddenly, a zombie emerges and pursues her and, just as we’re wondering how she’s going to escape, a woman named Roxy changes the channel and we realize that we were just watching a movie. Or were we? Soon, Lucy is desperately pounding on Roxy’s front door, begging to be let in. And the episode continues from there, building up to a clever twist that I’m not going to spoil here. I will just say that the final twist is very well done and that a wonderfully catchy song plays over the end credits. You’ll be singing it after the episode ends. The second episode, RSVP, follows a bunch of rich kids as they break into a haunted house and play with a Ouija board. As you can probably guess, chaos ensues. RSVP is an effective haunted house tale, full of atmosphere and ghostly mayhem. 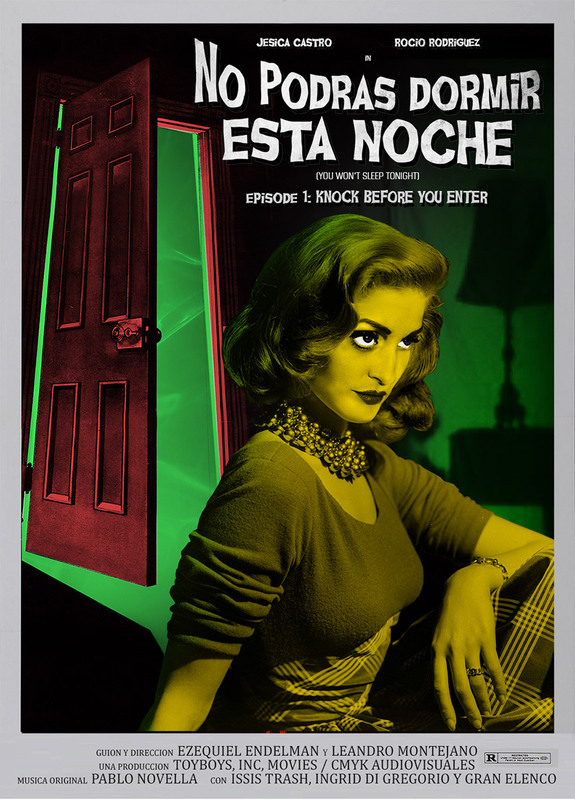 And, if I’m not mistaken, RSVP also pays homage to Dario Argento’s Three Mothers trilogy, which again shows that the people behind No Podrás Dormir Esta Noche know their stuff. Personally, I can’t wait to see episode three! But, until episode three comes out, you should definitely watch the first two episodes of No Podrás Dormir Esta Noche. Golpee Antes de Entrar can be viewed at https://www.youtube.com/watch?v=q236sMRb8Vo. RSVP can be viewed at https://www.youtube.com/watch?v=DoVN5rhmw_4.